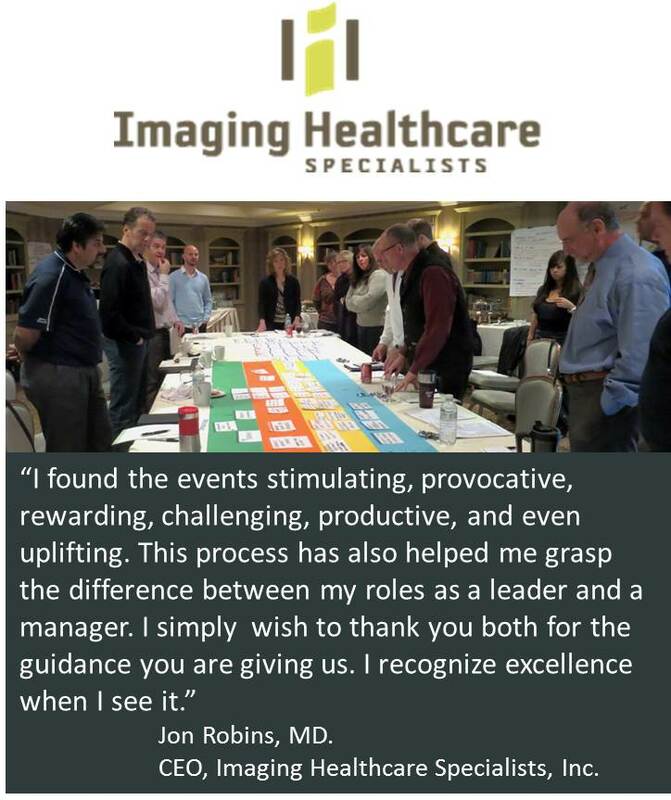 Imaging Healthcare Specialists (IHS) operates 10 medical imaging sites in Southern CA with a workforce of over 300 medical and operational staff. Strategic planning involving executives and directors. Transform culture for improved morale, collaboration, and innovation across disciplines. Reconceive organizational structure to increase operational flexibility, improve personnel distribution and morale across sites, and optimize patient experience. The rationale and context were set for a major company reorganization including ways to improve employee quality of life by reducing total commute time. The leadership team was equipped with strategy map and balanced scorecard tools for better decision-making and communication. Top 18 executives and directors in the company participated in three collaborative retreat sessions (two days each) over a period of three months. Leadership development and coaching included application of a balanced scorecard strategic management system that was developed by the group. Process included analysis of the geographic distribution of IHS employee homes to help optimize personnel assignments across the 10 IHS facilities. Application of highly innovative Turnover Intelligence geo-analysis tools to assess and aggregate workforce commute time.